Andrei: Anatolii Aleksandrovich, could you please introduce yourself in a couple of words and tell us how long you have been with Raketa? Anatolii Cherdantsev: I was born in Ekaterinburg. I have an advanced degree in engineering from the Urals State Technological University. I have been involved with the watches business since 2002. Andrei: The Raketa factory has a long history dating back to the Russian 18th century under the rule of Peter I, but, if I am not mistaken, Raketa only began to produce watches in 1949. Could you please recount for us the main stages of the history of the Raketa factory from the moment it began producing watches. What were the first watches which were produced by Raketa and what kind of market were there destined to? Anatolii Cherdantsev: History is the root which makes our entire “tree” strong. The roots of the Petrodvorets Watch Factory (PWF) go to the ancient Peterhof Lapidary Works. The masterpieces which were created here have since become the pride of many Russian museums and palaces. The Peterhof Lapidary Works were created by Peter I in 1721 for the needs of the Imperial Family and they rapidly became the cradle the pioneering center for a a new type of lapidary art. In 1932 the factory was renamed as the “Factory of Precise Technological Stonework” and it soon began to release a certain amount of jewels used in the watch industry. In 1950 the Petrodvorets Watch Factory was tasked for the first time with the assembly of men’s wristwatches. Even though the Zvezda watches were being assembled from components shipped from the cities of Penza and Moscow and even though the total amount of assembled mechanisms was only in the tens of thousands, the transition to this new production demanded a great deal of efforts from everybody involved. This was also the time when another watch brand named “Pobeda” (“Victory”, in commemoration of the victory over Nazi Germany in the “Great Patriotic War” – Andrei) was assembled from components from the Moscow Watch Factory. Nonetheless, the specialists of our factory succeeded in building all the tools and equipment needed to build our own watch parts and components. By 1951 the amount of assembled calibers increased by a factor of six and a half. By 1954 our factory was already producing 276’000 wristwatches each year and these watches were assembled from our own components. In 1956 a group of young engineers created a new type of watch named “Rossiia” and, a couple of months later, yet another new type called “Record” which were only 2,7mm in thickness. In 1977 the last assembly line for watches was closed and we fully transitioned to a fully automated production model. It is then when a unified, base, mechanism “Raketa” was designed and produced. This mechanism became one of the best in our country and ot was subsequently used as the basis for over twenty modifications of the Raketa watches, including anti-magnetic ones, watches for polar explorers, automatic watches, etc. Andrei: Can you tell us when the first 24 hour watch was produced in Russia? When was the first 24 hour Raketa watch made? Do you have a picture of such an early Raketa? Who created the first 24 hour Raketa? Anatolii Cherdantsev: Unfortunately we don’t have any information about when the first 24 hour watches were created in Russia or the USSR. In pre-Revolutionary Russia the watchmaking business was not very developed and most new ideas were imported from the West. During the Soviet era, the State was the sole owner of any design concept or means and somebody could end up in jail for designing something deemed “unnecessary for the people”. Of course, there were talented inventors and engineers, but their names were never publicized and they remain unknown. Watch factories were first built in the mid 1930s in Moscow and Penza. Research and development teams were formed and soon original parts and mechanisms were designed. In 1949 the PWF began producing the “Pobeda” mechanisms (with a non-shock-resistant second seconds dial) whose case, bridges and gear train were built in a fashion which made any changes or adding complications impossible. These mechanisms were assembled from parts produced by the First Moscow Watch Factory. – The high level of technical expertise of the specialists involved and the creation of special research and development teams. – The desire of the State to foster the development of high-technologies and better equipments. – An improvement of the financing for research and development industries. – The “Iron Curtain” which prevented us from gaining access to the best foreign technologies. In 1962 the PWF began the production of the new shock-resistant mechanism “Rossiia” with a central sweep seconds hand. Almost immediately a 24-hour modification of the “Rossiia” was designed and produced. 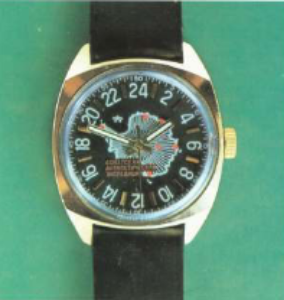 This was the time when the USSR was achieving tremendous successes in the conquest of space, in aviation, in the exploration of the South and North Poles and the State identified a need for watches which would be adapted for the use by polar explorers, watch officers on gas and oil extraction sites, sailors and pilots. An amazing team of engineers lead by Mikhail Arsentievich Kisilev and Ivan Alekseevich Starkov jointly designed, developed and produced the new mechanism. By that time special tools and a testing workshop were created which made it possible to switch to a new production in record times and to thereby rapidly respond to any changes in the demand for watches. Still, the “Rossiia” mechanism had reached its limits and was found to be inadequate for further improvements or modifications. All the ideas which had been developed so far were thus implemented in the new “Raketa” mechanism which was created in 1968. This new mechanism was capable of featuring many types of modifications including disk and hand based calendars, automatic winding, repeaters, etc. The 24-hour modification was also made at that time. Kisilev and Starkov were put in charge of developing the “Raketa” mechanism and they added a calendar in 1969 and a screw-less balance wheel was introduced in 1972. The automatic winding modification was introduced in 1976, but this variant was found too be labor intensive to produce and too expensive for the typical user to afford. This variant was discontinued in 1980. The following engineers played an important role in the design, development and production of the Raketa mechanism: Liudmila Iakovlevna Voinik, Liudmila Nikolaevna Chingi, Rimma Ivanovna Kolesnikova, Lidia Mikhailovna Didinkina as well as many others. Andrei: How has Raketa managed to survive the crisis of the 1990s and the breakup of the Soviet Union? How many people are you currently employing and how is your work organized? Anatolii Cherdantsev: In the 1980s the PWF employed about 6’000 people and our factory was like a city all by itself. We had our own medical dispensary, recreation centers, factory summer camps for our children, our own hotels, a stadium and a developed social infrastructure. In the 1990s, however, we were faced with the combined effects of the collapse of the demand for our products, the mass import of cheap Chinese watches and the sharp increase of the costs of energy. All this, combined with mistakes made by the management, brought the production to a complete halt on several occasions. As a result, the factory was closed down and most of its employees laid off. A limited number of departments, such as watch assembly, were kept. In the 1990s our factory was faced with many difficulties during the transition to a market economy while at the same time facing the “gray import” of Chinese watches sold at dumping prices. The immense productive capabilities of the former giant of the Russian watchmaking industry simply could not be supported in this context. In 2004 the factory underwent the process of bankruptcy and was broken up into two different companies: one in charge of renting the former offices of Raketa, and another one which would continue to manufacture Raketa watches. We are currently producing six calibers based on the “Raketa” mechanism: the 2609 NA (classical three handed mechanism), the 2623 (24 hour mechanism), the 2614 (single calendar), the 2628 (double calendar), the 26690 (with three extra dials: weekday, 24 hour dial, day of the month) and the 266891 (lunar calendar). The joint-stock company Raketa currently employs 30 full time employees, who are all top level specialists, and another 20 independent contractors who are called in to work on specific aspects of the production of mechanism components. As in the past, Raketa remains a real watch manufacturer since the bulk of our parts are produced in our factory. Andrei: Besides Raketa, the other company offering 24 hour watches is Volmax ( which builds the Aviator, Sturmanskie and Buran brands); Vostok also used to offer 24 hour watches, but they have stopped doing so. According to the President of Volmax, Valentin Ivanovich Volodko, 24 hour watches do not constitute more than about 4-6% of the entire Volmax production. What proportion of the production of Raketa is constituted by 24 hour watches? What is the importance of 24 hour watches for Raketa and for the Russian watch industry? What percent of your watches are aimed at the Russian market and what percent is shipped abroad? What countries are Raketa watches exported to? Anatolii Cherdantsev: Watches with a 24 hour dial and mechanism are something of a flagship product for Raketa. The people who purchase them nowadays are mostly young people who do not want to “follow the herd” and appreciate the originality of a 24 hour dial. In fact, a major part of our exported production is constituted by 24 hour watches. We believe that they are so popular because they combine originality with an unbeatable cost-quality ratio. Our main export countries are Germany, the UK and Romania. Watches with a 2623 caliber have constituted 16% of our total production in 2008, but based on the figures for the first six month of 2009 this proportion will double to about 30% of our total production in 2009. I have to stress here that, just like so many other brands, Raketa has suffered from a proliferation of counterfeit watches and, alas, fake 24 hour Raketa watches are particularly prevalent at this time. We have placed a list of “blacklisted” sellers of these forgeries on our website (for those who do not read Russian: at this moment the Raketa site has the following eBay stores on its “black list”: “Russian_dvd”, Juri Levenberg and “Ruscamera store” – Andrei). Be very careful not to purchase such counterfeit watches! Andrei: Raketa watches are renowned for their amazing sturdiness combined with excellent accuracy – what is the secret of this toughness? Also, while Raketa watches are often praised for their mechanisms, the cases themselves are often accused of being cheaply made. What would you answer to such a criticism? Anatolii Cherdantsev: the toughness and accuracy of the Raketa mechanism has its roots in the special design requirements which were included in the planning phase of the mechanism’s development and which determined the unique design of the main plate and the bridges. There are some particular construction techniques involved here. For example, the metal sheet from which the main plate and bridges are cut is held in place by holding devices fixed into special holes during the manufacturing processes. The sheet, main plate and other parts are thereby kept away from any risks of tension or deformation, even minute ones. This is just one example among many unique techniques which we developed to achieve a high level of accuracy in our mechanisms. But the main thing is, of course, the high skills and dedication of our engineers. We commissioned a special series of test from a Swiss company in June 2009 which showed that our mechanism was particularly tough and that in many aspects it was even more robust then our watch cases. This kind of results were made possible by a series of design characteristics which guaranteed the solidity and accuracy of our mechanism. By the way, we get a lot of feedback by regular and electronic mail from our customers and some of the stories they tell us border on the unbelievable. For example, one man lost dropped his watch in this garden and only found it a year later. He wound up the mechanism and it worked flawlessly (after surviving a *Russian winter* outdoors! – Andrei). In regards to the quality of our cases, I would say that we kept the old, traditional, type of cases, which stress the functionality of our watches and which can be worn by any person, regardless of age or income. The quality of the case itself is fully up to the norms of the industry, which cannot be said of the copies which we see coming out of Asia and which are often made of cheap alloys. Andrei: Raketas are sometimes criticized for their lack of strong water resistance. Is that a fair criticism? Anatolii Cherdantsev: In our lineup we have truly water-resistant watches, but these watches do cost more than those with a basic splash-resistant design. Andrei: How do you envision the future of Raketa? Anatolii Cherdantsev: We plan to expand and modernize our current lineup of watches, but we will keep their main traditional features. The main thing is to preserve the quality and reliability of our mechanisms. For this, we need to train a new generation of specialists. We strongly believe that to train such a new generation of engineers is one of the most important aspects of our mission. Andrei: Thank you very much!